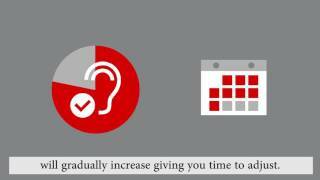 Hearing loss can have many causes and be either gradual or sudden. Certain types of hearing loss can be medically treated, but other types cannot. A person with hearing loss can however be helped with technology. Read more about the different types of hearing loss treatments. One of the most common hearing loss treatments is the fitting of individual amplification devices. Hearing aids are a type of amplification device that make sounds easier to hear. Working with a professional will give you access to the best hearing loss treatments. All hearing loss is unique, and a hearing care professional can help you choose and adjust the technology that is right for you. Are hearing aids a hearing loss cure? Hearing aids don’t cure hearing loss. What they do is amplify sounds, so they’re easier to hear. New users may find that it takes a few weeks to get used to hearing aids. This is typical, although some users acclimate more quickly to amplification. As you get used to hearing sounds again, it will seem more natural to you. A bimodal hearing solution is when you have a cochlear implant on one ear and a hearing aid on the opposite ear. Together with Cochlear, the global leader in implantable hearing solutions, we have a partnership called the Smart Hearing Alliance and we have developed a Smart Bimodal Hearing solution. Waiting to treat hearing loss can result in people missing out on conversations with family and friends. It can even lead to feelings of isolation. Research shows that seeking out hearing loss treatment as quickly as possible can help improve an individual’s cognitive abilities. If you feel you have a hearing loss, contact a hearing care professional to learn about hearing loss treatments today.